After competing in the quickest race in terms of duration, as the Sept. 3 Italian Grand Prix at the 5.793-kilometer (3.6-mile) Autodromo Nazionale Monza ended in a blistering 1 hour and 15 minutes, teams participating in the FIA Formula One World Championship head to the series’ longest race – the Singapore Grand Prix Sept. 17 at the 5.065-kilometer (3.147-mile) Marina Bay Street Circuit. Since joining the Formula One calendar in 2008, every Singapore Grand Prix has come to within four minutes of the series’ mandated two-hour time limit. The 2015 race was the longest, eclipsing the two-hour mark by 1 minute, 22 seconds. No one complains, however, as Singapore is a destination venue on the Formula One calendar. Its cutting-edge culture and incredible modernization have turned the tropical island located only one degree north of the equator into a global hub for business and tourism, with Formula One’s visit to the world’s only island city-state combining both in glorious fashion. Powerful lighting illuminates the track in such luster that drivers say it is clearer than in daytime, as there is no glare. And with those lights shimmering off the cars’ sinewy shapes as they shoot down the straights at 320 kph (200 mph) while sparks shoot from their underbodies, fans are treated to a sensory assault that can only be found at Marina Bay Street Circuit. Masking the awesomeness of 20 Formula One cars screaming around this elaborate track is the prowess drivers must possess to keep their cars in one piece. The walls surrounding Marina Bay Street Circuit are unforgiving, but in order for a driver to wring every ounce of speed from his racecar, he must dance with those walls while navigating the numerous bumps of the track’s surface. If that’s not enough, Singapore in September is hot. Really hot. And for added measure, really humid. As much as the Singapore Grand Prix is run at night for aesthetic purposes, nighttime is the coolest time for drivers and spectators alike. Nonetheless, temperatures inside the racecar can reach 60 degrees Celsius (140 degrees Fahrenheit). Despite the tough track and equally tough environs, the Singapore Grand Prix is embraced by drivers. The electric atmosphere of the city and the beauty of Formula One at night, where exhaust flames and glowing brake discs provide a technicolor display that goes unnoticed in daylight hours, are appreciated by the drivers. It’s a modern-day Monaco. The lights are bright at Marina Bay, and Haas F1 Team wants to shine. The American outfit comes into Round 14 of the 20-race Formula One schedule in an incredibly tight battle with fellow constructors Toro Rosso and Renault. With 35 points earned so far this season to place itself seventh in the constructors standings, Haas F1 Team trails sixth-place Toro Rosso by just five points while holding only a one-point advantage over eighth-place Renault. 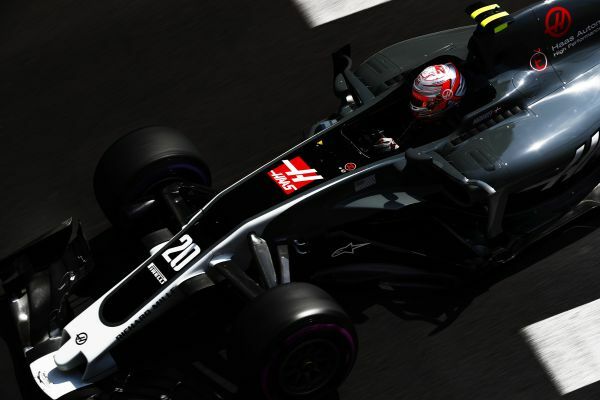 These razor-thin margins can change drastically with a strong, point-paying performance, and Haas F1 Team drivers Romain Grosjean and Kevin Magnussen are keenly aware of this fact. Grosjean last scored points two races ago in the Belgian Grand Prix with a seventh-place drive that pushed the organization well past its 29-point tally from all of last season. Magnussen’s most recent point-scoring effort was a seventh-place finish in June at the Azerbaijan Grand Prix. Both drivers are hungry for more points with only seven races remaining in 2017. Singapore, home to numerous restaurants serving high-end cuisine that satisfy even the most discerning palate, can dish up points for the less discerning Haas F1 Team. Points are points, no matter how they’re served, and in the 10th anniversary of the Singapore Grand Prix, a top-10 performance will yield those coveted points. The table is set in Singapore for Haas F1 Team. The past two grands prix have been at high-speed circuits where teams opt for minimal downforce. Belgium seemed to work out well for the team, but that wasn’t the case in Italy. Despite having to qualify in the wet on Saturday, what made these two high-speed tracks provide such different outcomes? “I think the outcome was not so different. In Monza, Kevin’s race pace was very good. Obviously, Romain starting last, then hitting somebody at the start and coming in on lap two to change the front wing, the race was gone. It’s very difficult to compete because you’re so far back, but Kevin finished 11th. Five teams finished in front of us. We were the sixth-fastest car. If one or two had dropped out, we would again have been in the points. So, it wasn’t a fantastic week for us in Monza. Spa was better. The car was in a similar performance level between the two races. It’s just like Spa, with a few dropouts, maybe it was better, and some of our main opponents being a little bit worse there put us into the points. Now you head to a street circuit where downforce is much more necessary. Is the Singapore Grand Prix a venue that suits the Haas VF-17 better than the high-speed tracks? Using the tire properly means finding its optimum operating window. With Pirelli bringing the Yellow soft, Red supersoft and Purple ultrasoft tire to Singapore, what are your expectations? Singapore is one of only three night races on the Formula One schedule, but it’s also the original night race. Do you like competing at night? With Formula One’s slate of European races over, use of the team’s transporters and hospitality unit is also over. How helpful is it to have all that equipment at the track on a consistent basis, and how hard is it to transition back to flyaway races? Singapore has become a destination venue for Formula One. What makes it such a desirable event? Singapore spurred more night races in Formula One just as Bristol (Tenn.) Motor Speedway spurred more night races in NASCAR. You’ve been to both. Can you compare the two? Are there any similarities? The schedule at Singapore seems to be very smartly laid out. Practice and qualifying is at roughly the same time as the race, providing consistent data for the teams. And fans across the globe get consistent TV times to watch all the coverage, as the times are the same as they’ve been for all of the European races. As a competitor but also as a stakeholder, can you describe how beneficial this is for Formula One? Can you describe the atmosphere generated by a night race? Is there a heightened sense of excitement and anticipation because the Singapore Grand Prix is so visually stimulating?